One of the three known 1894 British Honduras $1 notes will be offered by Stack’s Bowers Galleries on 12th and 13th January in New York City. It’s among the first British Honduras issues. No examples are known of the five higher denominations. One of the known examples is the Pick plate note, which is in bad condition. Another one is a part of a private British Honduras collection. The offered note is graded Very Fine 20 Net, Splits, and Rust, by PMG, and has an estimated value of $30,000 to $50,000. 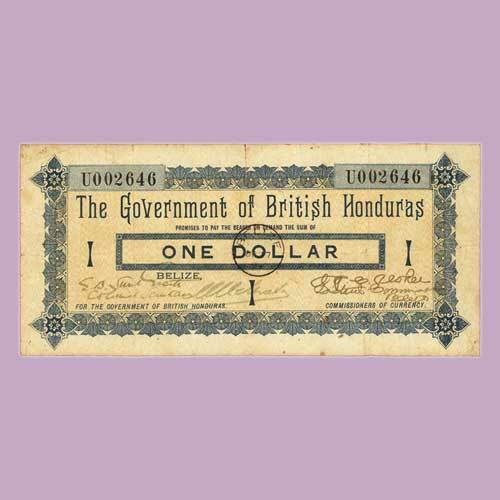 The note bears the signature of the then colonial secretary of British Honduras E.B. Sweet-Escott. It also features signatures of commissioners of currency C. Melhado and H.C. Usher. It has floral borders, lathe work, and stars within circles. It also depicts Crown above CC (for Crown Colony) watermarks, an official ink stamp for the city of issue Belize, and the date OC[tober] 17, 94. The left margin is jagged which originally was attached with a counterfoil. The note is rarer and more sought-after than Zanzibar notes as well. The 1894 British Honduras issue was withdrawn and destroyed after two months, while the Zanzibar series were in use for 20 years. The note was issued for a small colonial backwater with very small population and economy. Zanzibar, on the other hand, was the world’s major spice sources and slave exporter. It also acted as an international seaport falling within the trade routes of Africa, Arabia, India, and Asia. The note belongs to the family of Albert E. Morlan, who acquired it in Belize when he was named the American consul in Belize by President Chester A. Arthur in 1882. After his death in 1926, the note passed on from one generation to the next and finally reached consignor and the great-granddaughter of Albert.